I love Indian food. I love the spices, I love the mix of textures and flavours, and I absolutely love the variety you get in an Indian Thali. Indian thalis are platters that feature a number of dishes, alongside some kind of bread (such as naan or chapati) or sometimes rice. Most of the Indian food that people are familiar with are from North India, but it is important to note that there are many regional differences in Indian food. This is something I’d like to learn a little bit about, but I haven’t started researching it yet. 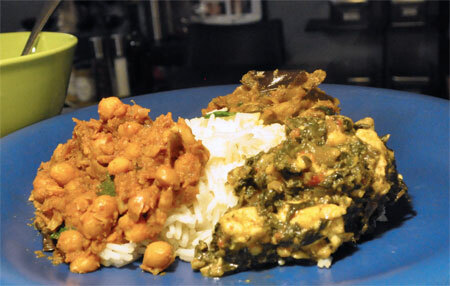 My first Thali (clockwise from the top): Baingan Bharta, Saag Paneer and Chole. I love to make Indian-inspired dishes at home, but haven’t had much success at making restaurant style dishes until recently. A few weeks ago, I tried a Palak Daal recipe that was fantasic but very lonely. We’re used to having multiple dishes in an Indian meal, so my loney daal didn’t go over as well as it should have. This inspired me to try making a group of dishes at once. There are two challenges for me here: successfully making restaurant-style Indian dishes AND making multiple dishes at the same time and timing it all out properly. It was a great experience, and left me with the confidence to try more in the future!! 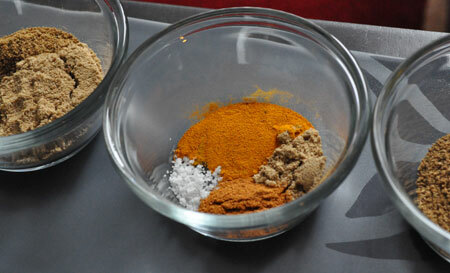 A mix of the spices I used in one of the dishes. Note: The following dishes may be served with rice, naan or paratha. I made 2 cups (dried) basmati rice to go with all three dishes. I also opened one can of diced tomatoes and used it across all three dishes, dividing the tomato chunks and the tomato juices. Heat 1tbsp of the oil in a frying pan, over medium high heat. Once hot, add the cubed paneer (or tofu) and fry until golden. Remove from heat and set aside. Heat the remaining oil in a saucepan over medium high heat. Once hot, add the jalapeno, onion, and garlic. Cook until the onions start to brown, or at least until they are tender and translucent. Add the chopped tomato and cook for two minutes. Add the spinach and salt and stir well. Cover the pot to cook for 5 minutes, or until the spinach has cooked down. Stir, lower the heat to medium, cover and cook for 25 minutes. Add the garam masala and stir. Add the paneer (or tofu). Cook uncovered for 5 more minutes or until there is little liquid left at the bottom of the pan. I had actually never had Chole before trying this recipe, so I’m not sure how it is supposed to taste. 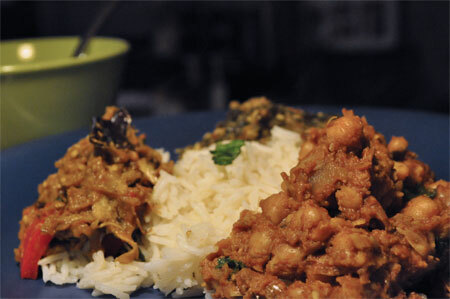 I chose it because it looked interesting, and I specifically wanted a chick pea dish for my thali. I’m glad I took a chance on a new recipe, because this was a great dish! It ended up being creamy and incredibly flavourful. It also made good use of the juices left from my canned tomatoes, so it went well with the other recipes. Heat 3 tablespoons olive oil over medium heat. Add the onions, garlic, green chile, ginger, curry leaves and salt. Mix well. Stir in the coriander, cumin, asafoetida and cinnamon. Cook for a few minutes until the spices become aromatic. Add the chickpeas and stir. Quickly pour in the tomato juice (or passata and water), paprika and garam masala. Stir well. Raise heat until the mixture bubbles. Then, lower heat and cover to simmer slowly for about 30-40 minutes. The sauce will thicken. You can either bake the whole eggplant, or cut it into big chunks to cook it faster. Heat the oven 10 400F, and bake for about 45 minutes. If baking it whole, turn it every 15 minutes. If you have cut it into chunks, flip the slices about half way through. Let the eggplant cool. Peel off the skin if you have baked it until it has blistered. Otherwise, I prefer to leave the skin on. Chop the eggplant in small pieces and keep aside. Use a blender or food processor to puree the tomatoes, ginger and jalapeno. Heat the oil in a saucepan on medium high and stir fry the bell pepper for about a minute. Take out the bell pepper from pan and keep aside. Use the same saucepan with remaining oil heat the oil little more. Test the heat by adding one cumin seed to the oil; if it cracks right away it is ready. Add asafoetida and cumin seed. After cumin seeds crack, add tomato puree, coriander powder, turmeric, red chili, and salt and let it cook for a few minutes. Add eggplant and let it cook on medium heat. Keep stirring the eggplant and mashing it as it cooks. Cook for about 8 to 10 minutes. Add bell pepper, fresh cilantro, and garam masala to the eggplant and mix it gently.